Some guests wore “Bring Bear Home” T-shirts. The event included dinner, an open mike night, raffle, and DJ Leroy Roderick playing music throughout the night for dancing. 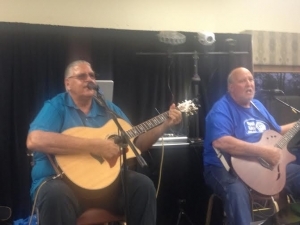 Elijah’s grandfather, “Beaver” Curo and his Uncle, Pat Curo, played their guitars and sang together. 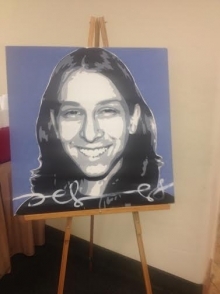 Then the chair of the Barona band of Mission Indians, Clifford LaChappa, godfather to Bear’s mother, Leilani Thompson, spoke.. “Myself and my family went to a similar situation,” he said, recalling his son, Matt, who suffered a heart attack while pitching for the Padres as a minor league baseball player. Matt LaChappa remains in a wheelchair with disabilities from the unexpected medical crisis. His situation was similar to Bear’s because of the unknown outcomes. Chairman LaChappa acknowledged that God was in control. Mandy Curo de Quintero, Bear’s cousin, also played guitar and sang. Other people who were near to the family also sang, including a relative, Robert Banegas, and Danny Necochea from the Barona tribe. 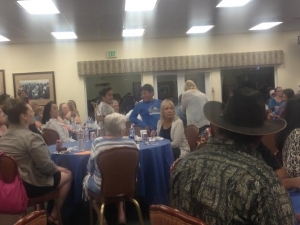 About 20 volunteers participated to make the fundraiser a success. All proceeds will go towards the search for Bear.